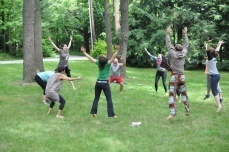 What if exercise was a playful expression of feeling alive? I see a world where humans express their individual selves, in whatever way is meaningful for them, while sensing their place in a larger community. The path I see that takes them there is outdoor physical exercise. Joyful physical movement transforms dis-empowered bodies to individuals that are filled with strength, power, creativity and inspiration. I see the pull of the natural world drawing crowds of people out of indoor spaces like office buildings and gyms to experience the sensations that come from moving in our most primal and natural setting, the outdoors. All limiting feelings like worry, stress, competition and fear can’t help but melt off of warm bodies when they connect bare skin to the earth. Inspiration and creativity flow in abundance when people breathe in the fresh air that the Earth's precious trees breathe out. I see a world where all people are forever committed to the health and preservation of themselves, Mother Earth, and their community through joyful physical activity. I am asking my physically active clients and friends to share it through social media to their own community (many of them gym-goers!) this Wednesday, March 20th, 2013, the first day of spring.